“TLC A Paradigm Shift in Personal Development” is a professional presentation to suit conferences and seminars. Leadership skills, team building, self confidence and customer focus are all looked at in a refreshingly different light, a serious presentation with a hint of humour! Barbara is an accomplished speaker, adapting her talks to suit any occasion whether it is serious, educational or entertainingly funny. Her TV Appearances include: Vets in the Country, County File, Peak Practice, the Big Breakfast, Calendar TV, Look North, Calendar Holiday Breaks, BBC Digital Holiday Programme, CITV, UK Style, BBC2’s Natural World and 3 appearances on American television. Radio programmes include: Woman’s Hour, Radio Five Live, Radio Japan Live, plus several BBC local radio stations, and the work she does has been featured in such prestigious publications as County Life, Country Walking, Woman and Home, The Telegraph, The Times Educational Supplement, The Times, Yorkshire Post, Telegraph and Argus, Dalesman to name but a few. She is a published author of six books with a seventh in progress and produces her own magazine called ‘Freedom of Spirit’. When you book Barbara don’t expect her to turn up unaccompanied, there is always at least one four legged friend trying to keep her in check! 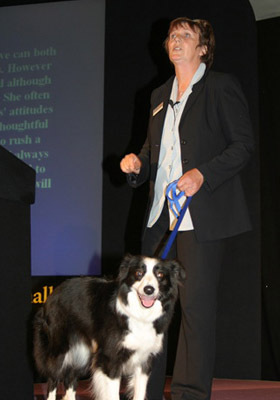 “What a wonderful and entertaining talk, full of humour but very thought provoking, your enthusiasm and energy for your work was very apparent and was reflected in the loyal support you were shown by your canine assistant, Skye”.